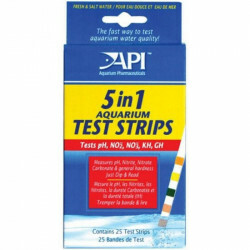 Aquarium Pharmaceuticals 5 in 1 Test Strips test aquarium water levels for optimal health! This master test kit allows you to simplify your testing routine. 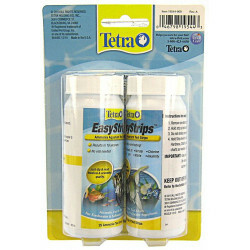 These strips can be dipped directly into your aquarium, no test tubes or separate samples are required. 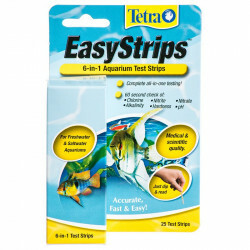 Highly precise color charts make it easy to determine aquarium levels to keep your fish healthy and thriving. 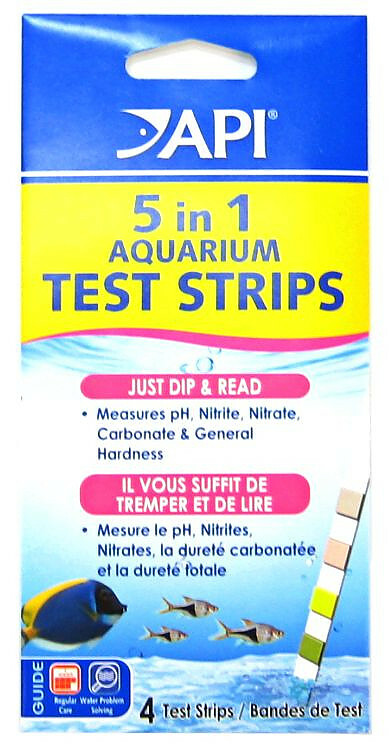 Test for pH, nitrite, nitrate, general hardness and carbonate hardness all on one strip without multiple test tubes. 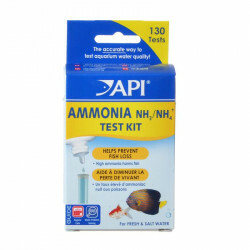 Range for pH is: 6.4, 7.2, 7.6, 8.0, 8.4. Range for total hardness is: 0, 25, 50, 120, 250, 425. Range for alkalinity is: 0, 80, 120, 180, 240, 300. Range for nitrite is: 0, 0.5, 1.0, 3.0, 5.0, 10.0.